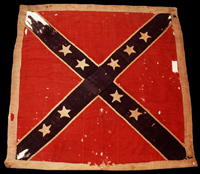 This flag belonged to the Staunton artillery (Garber's battery), Virginia. It is unclear why the artillery battery used an infantry flag, and didn't have a regulation artillery flag measuring 3 feet square. It's possible that since the flag is a late war model, that the artillery model wasn't available.